We propose a new generic framework for achieving fully secure attribute based encryption (ABE) in prime-order bilinear groups. Previous generic frameworks by Wee (TCC’14) and Attrapadung (Eurocrypt’14) were given in composite-order bilinear groups. 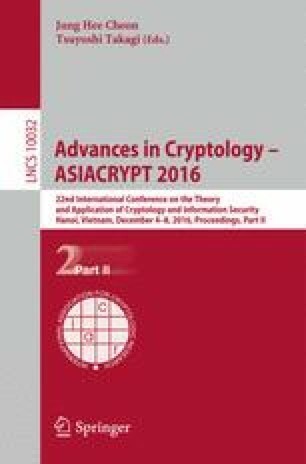 Both provide abstractions of dual-system encryption techniques introduced by Waters (Crypto’09). Our framework can be considered as a prime-order version of Attrapadung’s framework and works in a similar manner: it relies on a main component called pair encodings, and it generically compiles any secure pair encoding scheme for a predicate in consideration to a fully secure ABE scheme for that predicate. One feature of our new compiler is that although the resulting ABE schemes will be newly defined in prime-order groups, we require essentially the same security notions of pair encodings as before. Beside the security of pair encodings, our framework assumes only the Matrix Diffie-Hellman assumption (Escala et al., Crypto’13), which includes the Decisional Linear assumption as a special case. Recently and independently, prime-order frameworks are proposed also by Chen et al. (Eurocrypt’15), and Agrawal and Chase (TCC’16-A). The main difference is that their frameworks can deal only with information-theoretic encodings, while ours can also deal with computational ones, which admit wider applications. We demonstrate our applications by obtaining the first fully secure prime-order realizations of ABE for regular languages, ABE for monotone span programs with short-ciphertext, short-key, or completely unbounded property, and ABE for branching programs with short-ciphertext, short-key, or unbounded property.